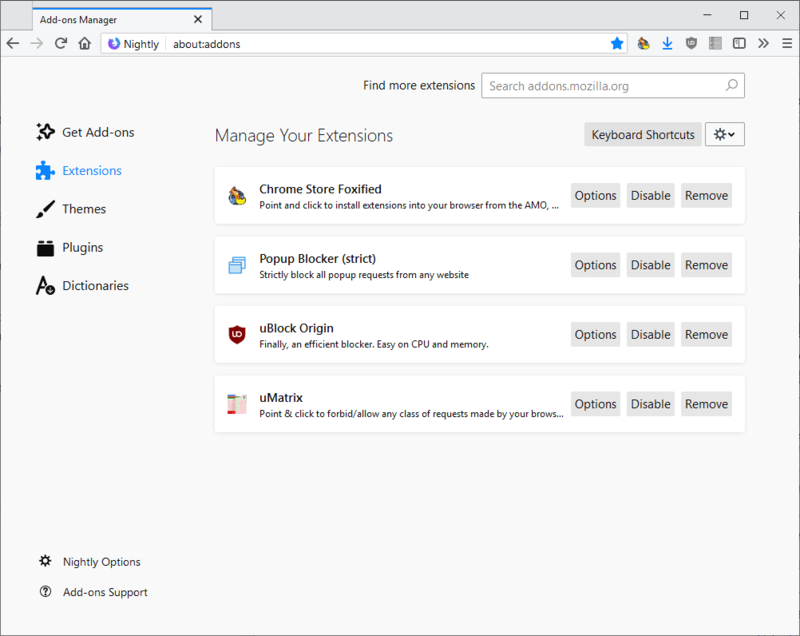 Mozilla plans to integrate a keyboard shortcut manager on the about:addons page of the Firefox web browser. 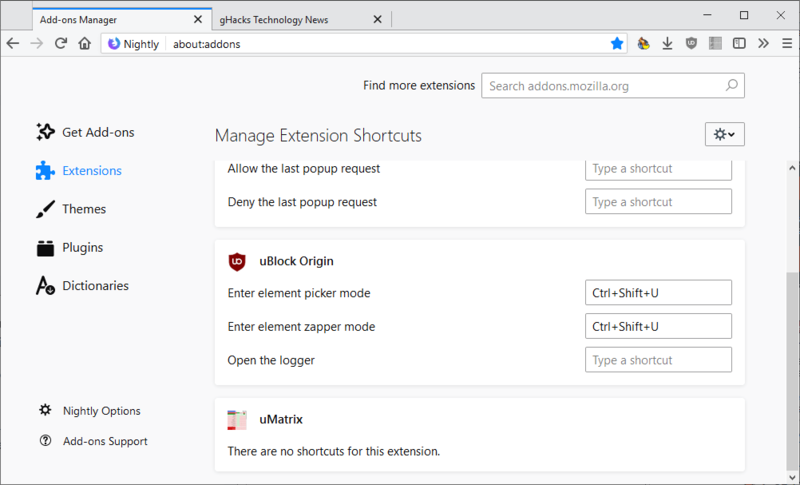 Firefox extensions may map keyboard shortcuts to certain functionality; keyboard shortcuts may speed up certain operations as it may be faster to use them instead of navigating through mouse or touch-based menus. 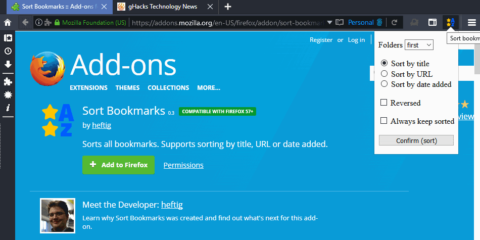 Firefox 66, currently available as a Nightly development version, features the new functionality already. 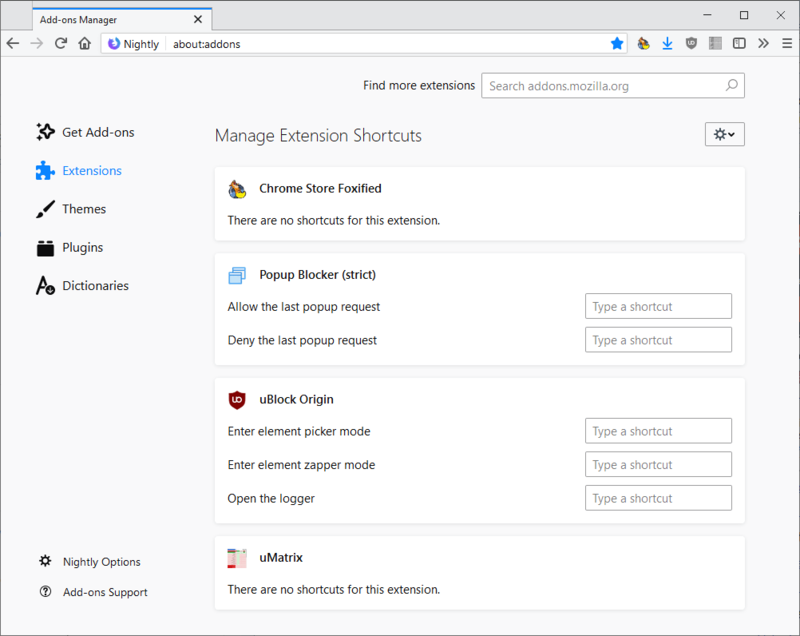 Firefox users who open about:addons in Firefox 66 may notice a new “keyboard shortcuts” link on the manage your extensions page. A click on the new button opens a new page that lists all keyboard shortcuts mapped by all extensions that are enabled in the web browser, and keyboard shortcuts that may be mapped. Extensions that don’t support keyboard shortcuts show “there are no shortcuts for this extension” whereas extensions with keyboard shortcut functionality the functions that can be mapped to shortcuts. Some of the available shortcuts may come as a surprise as extensions may not list them in the options or provide users with options to change them. Each shortcut is listed with a description and the shortcut field. The popular content blocker uBlock Origin list three shortcuts: “Enter element picker mode”, “Enter element zapper mode”, and “Open the logger”. Activate the “Type a shortcut” field to assign a keyboard shortcut to the function. Note that shortcuts need to include Ctrl or Alt, but may use other modifier keys such as Shift as well. Firefox notifies users when native shortcuts are selected; you cannot map Ctrl-T to a function on the Manage Extensions Shortcuts page as it is used to open new tabs in the browser. One issue that you may run into is that Firefox does not check if the shortcut is mapped to another extension function already. Considering that the feature just landed, it is likely that Mozilla will resolve this issue and others before the integration in Firefox Stable as it is listed as a bug already on Bugzilla. Keyboard shortcuts mapped to extension functions work on any page the extension runs on. Just activate the shortcut to run the mapped function in the browser. List all extension shortcut functions and the keys they are mapped to. Reveal keyboard shortcuts to users that may not be configured directly, and let them configure these directly. Change keyboard shortcuts comfortably from a central location. 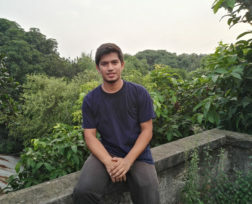 Extension developers may want to check the available API to integrate the functionality into their extensions for Firefox. Now You: What is your take on the new management functionality? Ghacks needs you. You can find out how to support us here or support the site directly by becoming a Patreon. Thank you for being a Ghacks reader. 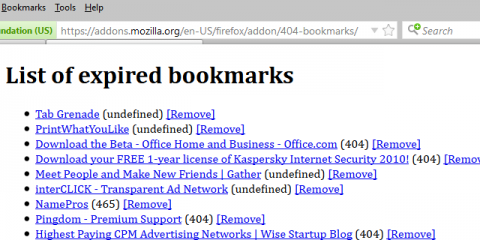 The post Manage Firefox Add-ons keyboard shortcuts on about:addons appeared first on gHacks Technology News.